To reduce your cost, Brandsport offers this item in Bulk (sold here individually). Gorilla also lists this same item in a 16-piece # 20032SD and 24-piece # 20034SD kit. 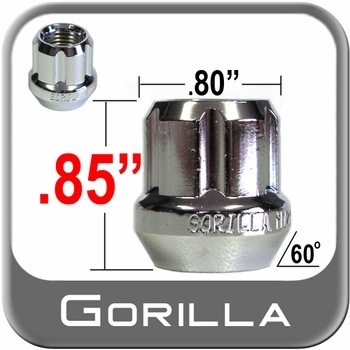 The precision fit from Gorilla Chrome Small Diameter Tuner lug nuts is what you need. The excellence in quality is evident with Gorilla Chrome Small Diameter Tuner lug nuts. Easy replacement comes with the Gorilla Chrome Small Diameter Tuner lug nuts. Help your wheels look sharper with Gorilla Chrome Small Diameter Tuner lug nuts.